Drawing on films released since 2000, Dr. McFadden’s book project, Screening Racialized France, evaluates contradictions in contemporary France pertaining to citizenship and the French Republic, especially in terms of inclusion and exclusion, equality and inequality. The films in her study confront past colonial violence and make visible white cultural dominance, while showing the origins and persistence of racist attitudes in contemporary France. They reveal how the effects of a colonial racialized system of inequality still reverberates within multicultural France today. Specifically, she asks, “How do I discuss race in the French context that disavows the phenomenon or states that it is simply irrelevant for its citizens?” While French culture has expanded beyond the brie and baguette stereotype to include couscous, national and cultural identity has yet to be decolonized and still often produces a very limited set of white European traditions. By exposing these social injustices, this constellation of films collectively imagines the contours of a more just republic for all French citizens. 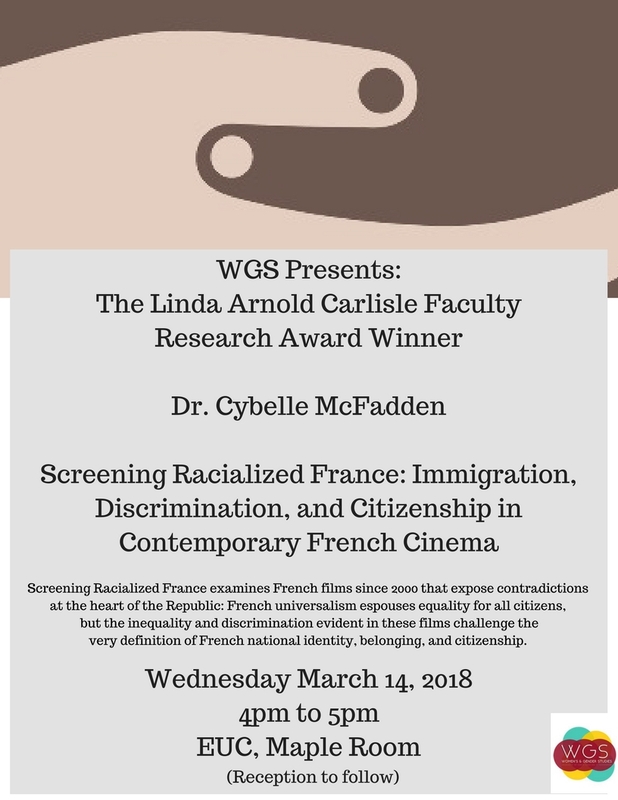 McFadden shows how a plurality of filmic perspectives give visibility to different forms of racialized citizenship in France, while expanding beyond historic and cultural forms of exclusion and violence, to clear space to imagine a more just society. WGS would like to thank Dr. McFadden for her excellent work and all those who were in attendance.